This image shows an overhead view of the Mars Exploration Rover Opportunity landing site at Meridiani Planum, nicknamed “Eagle Crater.” Scientists are conducting a soil survey here to see how the soils in this crater relate to the soils near the Meridiani Planum rock outcrop, as well as on the plains outside the crater. 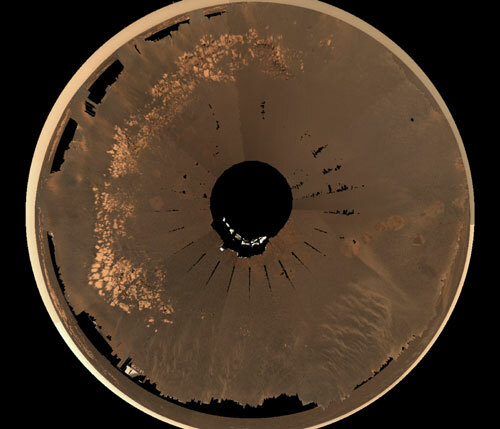 Scientists have studied the soils in great detail on the north and west sides of the crater, and plan to study five more locations before Opportunity exits the crater. As of sol 54 of Opportunity's journey (March 18, 2004), the rover is stationed at the sol 53 stop, located in the bottom right quadrant of this image. Scientists are examining light and dark soil targets at this spot, dubbed “Neopolitan” because it is a triple boundary between light soil, dark soil, and an airbag bounce mark. This 3-D visualization was displayed using software developed by NASA’s Ames Research Center and images from Opportunity’s panoramic camera, taken while the rover was still on the lander.